I admit I was interested in this book after I read about it when the movie was about to come out. I know a lot of bloggers really loved it too, so I thought I would try it, even though non fictions not my cup of tea. I have heard great and awful things about the book, so I wasn’t really sure what to expect. 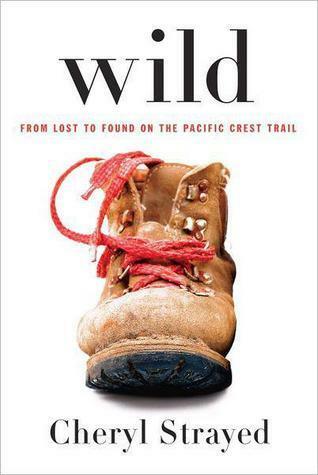 Many have complained the author is a whiny, self indulgent, narcissistic character, others that the story didn’t really focus on the Pacific Crest Trail. Some have gushed about what an amazing thing she did. It was a confusing place from which to start a book. If you are living under the same rock that I was here is a quick break down. Cheryl Strayed was pretty destroyed by losing her mother to cancer. Cheryl was 21?, and her mom in her very early 40s. Her siblings dispersed, her step dad remarried. Cheryl proceeded to destroy what was good in her life by repeatedly cheating on her husband, and then telling him. After separating from him, her life got even worse. She hooked up with a drug user and started doing heroin. She had an abortion. Just when it looked like she was doomed, she decided to hike the Pacific Crest Trail from Souther California to Oregon. She had never really hiked before-so probably not a very smart choice. She didn’t prepare physically or mentally. She just set out with a gigantic backpack. Honestly, at no point in this book did I think to myself- wow- she is brave, or strong, or smart. She was unprepared. She didn’t really know what she was doing. But- and here is the point, I think- of the whole story-she DID something. When she knew her life was going terribly wrong-she stopped, evaluating everything in the process. She TRIED to work through her problems on her own out there. There was no wonderful happy ending, except that she made it through and came out on the other side, while having one of the best, rewarding and amazing experiences of her life. I loved reading about all the wonderful people she met out there (though there were also some pretty creepy ones). I am really glad I read this book. It reaffirmed for me that we are all only human. We make mistakes. Hopefully, we learn from them and become better people. Now I can’t wait to see the movie! It sounds interesting although this isn’t my normal type of read… I hope you enjoy the film. I felt the exact same way when I read this book! I haven’t seen it yet, but I’m curious to see how it’s interpreted on film. I got this from a secret Santa, and I’m hoping to read it soon. I’ve been trying to read more non-fiction and am more comfortable reading memoirs so this one, being everywhere the last few months, seems like a good one to read. I;ve had this book since last summer and haven’t had the chance to read it. I resolve to get to it in 2015! Nice review, and I felt much the same way about this book, although I do think preparing for 6 months should count for something, it just wasn’t enough. It’s an interesting question whether she was brave or not — I would have been terrified. She wasn’t really afraid and bravery is when you do something you fear. On the other hand, setting out into the wilderness and walking across two states on your own is brave (and strong) to me. But that’s what this book makes you think about, which is why it works! I read it some years ago and I loved some parts, but on the whole, I didn’t find this book inspiring at all. It reminded me too much of ‘Eat, Pray, Love’. But the upcoming movie looks great, and I really think Reese Witherspoon can pull off that complex part. I just saw the movie and was surprised at how much I liked it. I went out and bought a copy of the book afterward.